FCOM diagnostics software allows you to perform complete diagnostics of all 1992-present Ford models. Diagnostics is performed via OBD-II connector (which is located near steering wheel). You can order all our Ford related products online from our sister website www.obdtester.com/order. We ship worldwide. FCOM is diagnostic software for Ford vehicles. Although it was not primarily designed for Mazda and few other brands, it works quite well with these vehicles. Smart multiplexed Ford OBD2 to USB diagnostic interface is included in price. FCOM is able to diagnose wide range of control units (PCM, ABS/ESP/VSC, IPC, BCM, ...) and covers vehicles since 1996. [Read more...]. PATSCODE.com is online authorization service for all Ford coded passive anti-theft system (PATS) immobilizer operations. It can be used with both FCOM and Ford IDS. 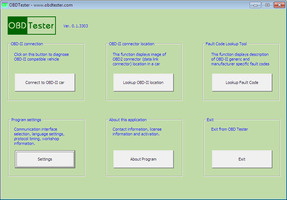 OBDTester is universal, fully-featured OBD2 diagnostic solution. OBDTester comes with ELM-USB OBD2 interface and works under MicrosoftÂ® Windows XP/Vista/7, Linux or FreeBSD. Although OBDTester is generic tools, it is possible to use it for Ford PCM diagnosis, making it ideal low-cost solution for hobby users. Please note that other control units (ABS, IPC BCM, RCM, etc) cannot be diagnosed with OBDTester. For these you need to purchase FCOM.